Liven up your decor with this fashionable tilting wall mirror. Classic ingenuity and contemporary style harmonize in this modern wall mirror design. Polished chrome finish mounting brackets complement the simple beveled edge of the large oval mirror while a tilting mechanism allows for customizable angle adjustments. Mirror glass only is 32" high, 24" wide. 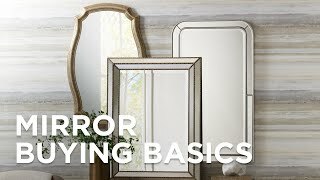 Add elegance to home decor with this frameless rectangular vanity mirrorfeaturing beveled glass and round satin nickel finish vanity mounts.